Therma-Tru, the most preferred brand of exterior doors in the business, is ranked year after year as the #1 brand building professionals use most, and as the most innovative company in fiberglass entry and sliding patio door systems. Bringing you ENERGY STAR® Savings with Style. Therma-Tru, the most preferred brand of exterior doors in the business, is ranked year after year as the #1 brand building professionals use most, and as the most innovative company in fiberglass entry and sliding patio door systems. It's a reputation they have been building on for more than 40 years. Fiberglass doors won't dent, rot, or rust and withstands wide temperature ranges. Our impact rated doors are designed with a steel plate inside to withstand hurricane force winds. 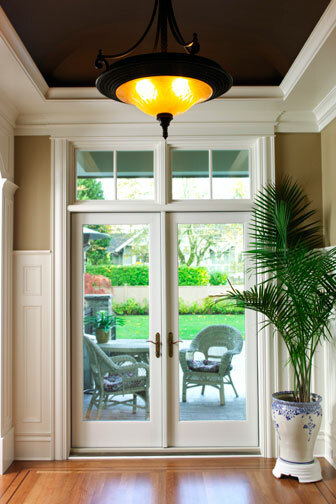 The secret to Therma-Tru Fiberglass Door Systems is our Tru-Defence®, an integrated door system that provide a performance upgrade for all Therma-Tru fiberglass entry and patio doors. Therma-Tru doors are made to look and feel like real wood with options that include beautiful decorative glass patterns. Therma-Tru's AccuGrain™ technology is a process that results in accurate representation of every detail of premium wood grain, while offering all the advantages of fiberglass. Whether you select their American Style, Mahogany, Rustic, or Oak in their Classic Craft® and other door lines, you can be sure you're getting a grain pattern that replicates actual wood and a design that incorporates solid wood square edges, architecturally correct stiles, rails, and panels. Their durable fiberglass construction requires less maintenance than wood or steel doors. Therma-Tru's solid foam core offers 5 times the insulation value of wood and its' glass is triple pane insulated and tempered for safety. Therma-Tru offers a wide range of door lines: Classic-Craft® Fiber Classic® Door Systems, Smooth Star® Door Systems, ProEdge™ and Profiles™ Door Systems and Traditional Door Systems. Therma-Tru® has received the following awards: MVP AWARD 2006 Building Products®, Professional Builder® Therma-Tru® Best in Class 2006 Entry Doors, Home Safety Council®, and Woman's Day® 2006 Home Remodeling Award. © 2019 Marvin Design Gallery by Evanston Lumber. All rights reserved.